What’s in a cellar anyway- what’s in your cellar? Stockpiles for just the right moment that may or may not ever arise? A cove of thoughts and dreams, plans and possessions. For posterity, for a rainy day, for safe-keeping, for the rager of the century. All things that will come and go. Time is a ____ thing, and when related to wine (when related almost anything), as mysterious as ever. Cellar- survival- salumi and potatoes- (Nintendo, washer and dryer, Dad’s dumbbells?) shielding people and provisions from weather and time. 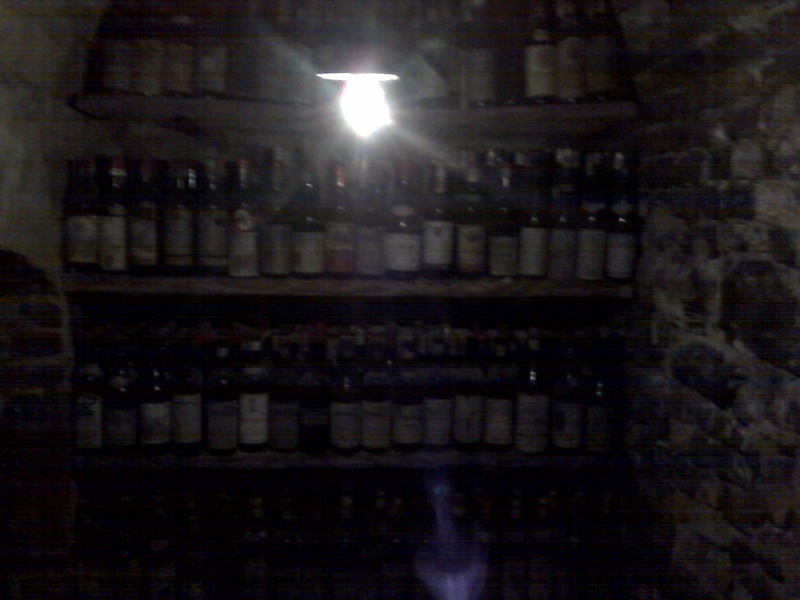 To cellar, it’s become a verb, cellaring. A collector’s hobby- what to acquire, what to seek, how long to keep it, define your cellar, your stock, your store. How much to squirrel away? To pursue the wines, or let them come into your world as they may? A special vintage every here and there? So many things to commemorate. Why do we keep them? Is it like displaying books that you have already read? To warm a room, show off a bit, conversation material, reference material, mostly because they bring you comfort just to know they’re there? Regardless of the designated spaces that we create for our wine- a simple rack in any closet/ cabinet/ garage- there is something to be said for a true cellar to properly store precious bottles. Somewhere below ground, a consistent 55° F, a little bit moist (to keep the density of corks in balance), hidden from the sun. Conditions that exist naturally in certain climates, some of the best being built into hills. Where there are no hills, when you don’t feel like digging a giant hole, when you live in the Carolina lowlands- air conditioning will do just fine. There are also cellaring facilities which will store your wine as professionally as possible. A little impersonal, but it works. I find it difficult to maintain much of a wine cellar myself- impetuous lush that I am. Always keeping in mind the whole being here now thing, it requires too much waiting. So rare for me to look at a bottle and say you are for another day. So excited to give everything a try- to see how it is doing- right now– I want it to be part of my world, my taste memory, not lonely in a cellar. Even old wines. Even venerable wines. Even bottles that really could use some more time to themselves. A shame perhaps, but what good is that Lagrein doing staring at me, awkward, belly-up? Don’t follow my lead though (too much, at least)- a little delayed gratification can yield immeasurable rewards. That 2004 Barolo- 2001 Barolo- 1996 Barolo (Spanna on the mind!) revealing more of itself after a long nap. There is nothing like opening a bottle on just the right day and finding it has hit its stride, has fully come into itself, is so ready for you. How do you know? A little bit of trust, a little bit of chance. There are educated predictions about what you’ll find, but you won’t know until you try it since wine is, according to economists, an “experience good”. Drink enough and pay attention to what is going on. Eventually you will develop a sense about how a wine will age as you would with cooking or gardening or other such arts where we work in rhythm with natural processes- an experiment in science and beauty and time. All of those things that time can do. Of every event in our life we can say only for one moment that it is; for ever after that it was. Every evening we are poorer by a day. It might, perhaps, make us mad to see how rapidly our short span of time ebbs away; if it were not that in the furthest depths of our being we are secretly conscious of our share in the inexhaustible spring of eternity, so that we can always hope to find life in it again. CELLAR SCENE FROM FRANCOIS TRUFFAUT'S "STOLEN KISSES"